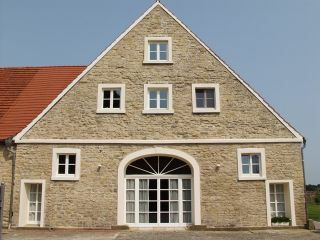 The Seminarhof Schoeppingen exists since September 2002. It offers a very special and caring atmosphere. We would like to invite you to do some creative work, to discover your senses, to experience protected body work and to experience nature, sun, wind and rain - but also to discover the sheltered garden, the studio and sauna as well as great food! You would like to realise your seminars and events - we offer you a space where wishes come true. Based on the experience of our own seminar work, we have built a house which is especially suitable for therapeutic, body or growth orientated work. We offer possibilities for creative and artistic processes, sensual experiences and mental recreation. More about the furnishing, accomodation and meals at our seminar house you will find on the following pages!